Researchers from Harvard University’s Wyss Institute and the University of California at San Diego have developed a one-of-a-kind flexible and extremely durable robot with a soft body. Traditional robots are made from rigid materials, including metal and hydraulic parts. 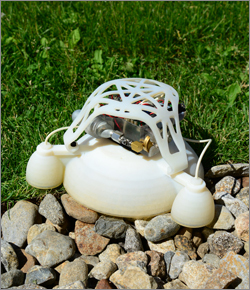 This robot was developed in a single build using a new three-dimensional printing strategy that allows for the incorporation of soft parts. The unique build allows the robot to move and leap explosively into the air by using butane explosions. “We leveraged additive manufacturing to holistically create, in one uninterrupted 3D printing session, a single body fabricated with nine sequential layers of material, increasing in stiffness from rigid to soft towards the outer body,” said the study’s co–senior author Robert Wood, PhD, who is a Core Faculty member and co–leader of the Bioinspired Robotics Platform at the Wyss Institute for Biologically Inspired Engineering at Harvard University, the Charles River Professor of Engineering and Applied Sciences at the Harvard John A. Paulson School of Engineering and Applied Sciences (SEAS), and Founder of the Harvard Microrobotics Lab. 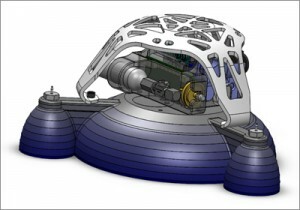 A flexible robot such as this one would be perfect to assist in search and rescue operations. Its jumping ability and soft body would come in handy in harsh and unpredictable environments or disaster situations, allowing it to survive large falls and other unexpected developments. This is one of the first 3D printed soft robots in the world and the first robot to be 3D printed with a gradient of stiffness. The three-legged robot can manage over 30 jumps – two and half feet into the air – without connection to an outside computer or power source. The combination of hard and soft materials, which its designers say make it a more efficient jumper, is actually inspired by nature. Its legs are pneumatic and its belly can flex. To move, the robot first inflates its pneumatic legs to tilt its body in the direction it wants to go. It then ignites a mix of oxygen and butane inside its combustion chamber, forcing its belly to flex outward, which catapults the robot into the air. “This new breakthrough demonstrates the power of combining insights into nature’s innovations with the most advanced man–made technological advances – in this case 3D printing technologies – when trying to overcome technical limitations that currently hold back a field,” said Wyss Institute Founding Director Donald Ingber, MD, PhD, who is also the Judah Folkman Professor of Vascular Biologyat Harvard Medical School and Boston Children’s Hospital and Professor of Bioengineering at the Harvard John A. Paulson School of Engineering and Applied Sciences.